Part of the fun of the Friendship Bread Kitchen is helping you find new and flavorful ways to use a cup of Amish Friendship Bread starter. And while baking is cathartic in many ways, there are times you want to do the bare minimum so you can get on with your day. I’m excited about this recipe because it simplifies everything. There’s no big mess to clean up or risk of burning down the house (confession: I have wandered away from my kitchen more than once to look up from my desk an hour later and wonder what that burning smell was). Better yet, you can program your bread machine to bake at whatever time you want so it’s ready when you are. It’s not foolproof, though, and every bread machine is different so be prepared to experiment with a loaf or two. But once you get it figured out, it’s bliss. The bread machine paddle does leave a gash at the bottom two inches of your bread, but that’s a small price to pay in exchange for saving you some serious elbow grease. The original Amish Friendship Bread recipe works great, but heavy add-ins may sink to the bottom. You can toss them in flour (which some people say doesn’t work, but I’ve had great luck with this) or add them towards the end. Whatever you decide to do, using your bread machine is a quick and easy way to use up a bag of starter and keep a loaf of Amish Friendship Bread on hand. 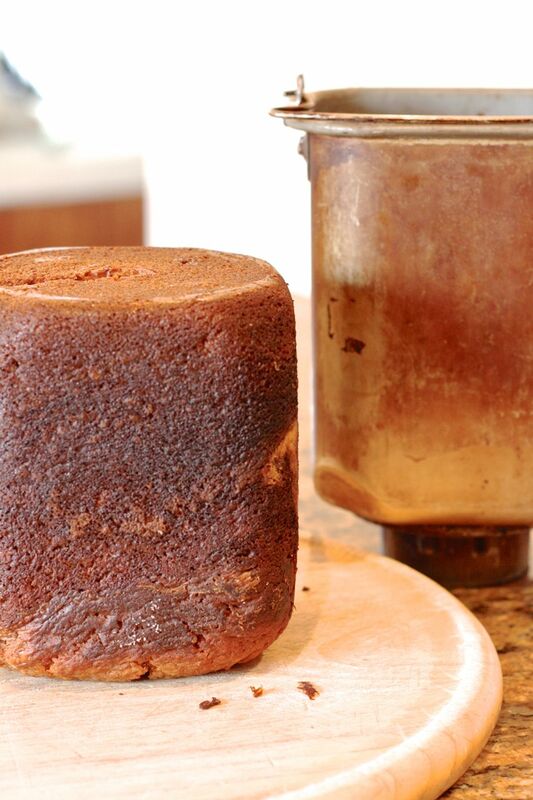 Use your bread machine to make Amish Friendship Bread baking (and clean up) a breeze. Add all the wet ingredients into the bread machine pan. Then add in dry ingredients. Set bread machine on Sweet Bread setting, light crust. During the last 30 minutes of baking, lift lid and quickly add on top of bread a mixture of ¼ cup sugar and ¼ teaspoon of cinnamon. When finished baking, leave in bread machine for 20 minutes. Remove from baking pan and put loaf on a cooling rack. The original Amish Friendship Bread recipe works perfectly for the bread machine. Bread machine flour was not used in this recipe. Various machines may have slightly different results (ours was more of a rectangular, rather than square, setting and had more height than width). If you're finding that your bread is not baked in the middle, make sure you're using the sweet bread/cake setting, choose a medium crust, and/or cut the recipe in half. From Becky T: "I just made the Garlic Onion AFB in my bread machine this morning and it came out wonderful. I layered the ingredients as stated in the recipe (no pudding). Set the machine to quick bread setting. About 30 minutes after starting I added the onions to the top for baking. After the quick bread setting went off I set the timer for 30 more minutes to cook because the bread did not look done on the top. This smelled wonderful while it was baking and tasted so good. I have now hidden the bread (after sneaking a piece) until dinnertime so that it does not get eaten by my boys (as they usually eat all the friendship breads I make within hours of making)! We will be eating it with homemade lasagna. I can’t wait to experience with the other breads in my bread machine (as this is the first I have tried using the bread machine)!" >> Tried this recipe? We’d love to see it! Snap a picture and we’ll add it to this page with credit to you. Submit your photo here. Who Gave You Your Starter Giveaway! ya i have prepared it — was so tasty! I used the sweet bread setting. Maybe mine doesn’t get hot enough? It is 11 years old. This was aowesme. Love your blog! where do you get the starter? I set my bread machine to the highest setting but I also combined the flour, bs, bp and oil together and the rest of the wet ingredients I beat together – then I added the pudding and the sugar and then the flour mix all together. This makes it come out as dough and a whole lot less wet. I also took the paddle out of the bottom of the bread pan and it came out a whole lotta better!!! Question….when you make the ‘starter’ do I use a cup right out of the first batch to make this recipe? Or do I have to wait the ten days and add all the other stuff? I have the starter ready — it’s day one. If you received the starter from someone else, you can use it on Day 1 but you probably won’t have any left over as generally only 1 cup is passed on to another person. If you made the starter from scratch, I recommend waiting the 10 days so your starter has a chance to build some flavor. You’ll also have enough starter left over to store, bake or share. Hope this helps, Heather! I love this site, this I will be using this. Give me a reason to pull out my breadman! Any advice for a substitute for the pudding? Hi there, CowgirlAmerica! The instant pudding gives the bread a flavor boost and keeps it moist. One of the wonderful things about Amish Friendship Bread is that you can make a lot of substitutions, additions or deletions, including leaving out the pudding altogether. We do have a homemade pudding recipe (which you would add to the recipe dry, not cooked) if you want to include pudding but otherwise most recipes work without it. Hope this answers your question, and if you have any more questions feel free to post them or check out our FAQs page. Happy baking! Possibly a silly question, but do you mix the dry and wet ingredients when you put them in the bread maker, or do you just layer them? Can I use my starter from my freezer or do I have to Feed it first? If you gave your starters a good feeding the day before you froze them (or on the day you froze them), then no. If you didn’t, or you don’t remember, let it thaw at room temperature and see if there is any activity. If there is, then you can bake with it. If not, try a Day 6 feeding. It helps to have a robust starter at the time you freeze it, too. Hope this helps! If I want to use buttermilk instead of the starter to this bread machine recipe, how much buttermilk do you recommend? Also do I add yeast? Hi Gayle! I haven’t tried the no-starter recipe in the bread machine, so I can’t say. I think the key here is to reduce the amount of liquids (from a recipe that would go into an oven), and as you can see we only use ¼ cup of milk + 1 cup of starter (and less oil). Since you’re not using the starter you’d have to replace it with a similar proportion as what’s in the no-starter recipe, but you may have to tinker a bit to get the flavor right. Please let me know how it turns out!